Media captionANALYSIS: Will Trump's tough approach on Pakistan work? The US government is cutting almost all security aid to Pakistan, saying it has failed to deal with terrorist networks operating on its soil. The state department said the freeze would remain in place until Islamabad took action against the Haqqani network and the Afghan Taliban. Earlier this week, President Trump accused Pakistan of lying and deceiving the US while receiving billions in aid. The Pakistan government has forcefully pushed back against the US, a key ally. After the earlier comments by Mr Trump it called attacks on it by US officials "incomprehensible" and said they "negated the decades of sacrifices made by the Pakistani nation". The US stance has been praised by India and Afghanistan, but China, which is investing tens of billions in Pakistan, has defended Islamabad. The Trump administration had already delayed handing over $255m (£188m) in military aid to Pakistan. In announcing the restrictions, state department spokeswoman Heather Nauert said she could not yet put a dollar value on how much aid was being cut. She said the US government considered that the Afghan Taliban and the Haqqani network were "destabilising the region and also targeting US personnel". On Thursday, the state department also placed Pakistan on a special watch list for "severe violations of religious freedom". The US and others have long complained that Pakistan gives safe haven to the Afghan Taliban and their allies, the Haqqani network, allowing them to carry out cross-border attacks in Afghanistan. That's something Islamabad denies but President Trump has escalated the criticism since he took office. Pakistan reluctantly joined Washington's War on Terror after the 9/11 attacks and has received billions of dollars in assistance as a result. That funding has been falling for some time because of US frustrations, but the uneasy relationship continued, as America needs the cooperation Pakistan does provide. 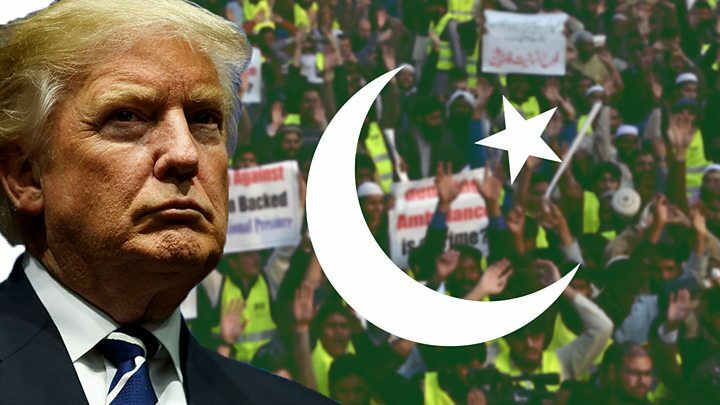 The Pakistanis say they've suffered great losses from the longstanding war against Islamist networks and are furious that Mr Trump fails to acknowledge the role they've played. Who are the militants Pakistan is alleged to support? The Haqqani network is a militant group that focuses most of its activities on neighbouring Afghanistan, which has complained for years that Pakistan allows it to operate unimpeded from its soil across the border. The group is linked to the Afghan Taliban - a hardline Islamic movement that poses a major threat to the Afghan government. Pakistani Taliban groups, while associated with the Afghan Taliban, focus on attacks within Pakistan. Both the Haqqani Network and the Afghan Taliban have launched attacks in Afghanistan that have killed US forces, and US officials have long argued that Pakistan, and specifically its ISI intelligence service, provides safe havens to them. The New York Times has reported that US officials were last year denied access by Pakistani officials to a member of the Haqqani network who they believed could help with information on an American hostage. Why would Pakistan support them? Pakistan has long been accused of using the Afghan Taliban to further its foreign policy interests in the country. The ISI first became involved in funding and training militants in Afghanistan after the Soviet invasion in 1979. Although since 2001 Pakistan has allowed its territory to be used to supply international troops during the war in Afghanistan, and co-operated with the West in fighting some terrorists groups like al-Qaeda, analysts say it has continued to give shelter and support to Afghan insurgents. Its aim has been to limit the influence in Afghanistan of its chief regional rival, India.